Designed to help protect enamel. Effective Cleaning. No.1 dentist recommended brand to protect enamel from acid erosion. Use with Pronamel toothpaste to help protect teeth against the effects of acid erosion. Soft microfine bristles.Sensodyne Pronamel toothbrush is designed to help protect tooth enamel and provide effective cleaning. 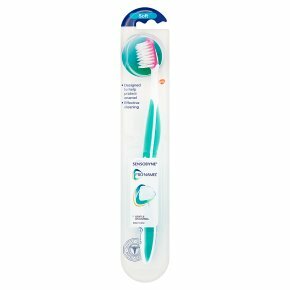 Its patented flexible gel pad holds the brush bristles to provide effective cleaning and the soft microfine bristle ends allow the brush to be gentle on tooth enamel. Use with Pronamel toothpaste to help protect your teeth against the effects of acid erosion. Children under 6 years should be supervised during brushing.<br>Do not allow bristles or toothbrush to be chewed.